As part of the series looking at the applications that are installed by default with the KDE version of openSUSE it is worth noting that there are two web browsers installed, Firefox and Konqueror. Konqueror is part of the KDE toolset and so it is no surprise that this is included. Does the inclusion of Firefox mean that Konqueror isn’t good enough on its own or was it installed just to give users a choice? The aim of this article isn’t necessarily to say which browser is better but to ask whether Konqueror has enough features to make the inclusion of Firefox superficial. For those of you coming from a Windows background, Firefox and Konqueror are to Linux what Internet Explorer is to Windows. It is hard to believe nowadays that there are people who haven’t heard of Firefox. For as long as I can remember Firefox has been battling to become the number one web browser and for years it fell short in terms of number of users (but not in terms of quality). It is equally hard to believe that people used to think Internet Explorer 5, 6 and 7 were the browsers to develop web pages for and every other browser was a nice to have. Despite always following the W3C standards web developers saw Firefox as a hindrance. After adding hack after hack to get the CSS to render properly on every version of Internet Explorer, if a website didn’t work properly on Firefox then that was just bad luck because not enough people were using it. Fortunately though, a sequence of events over the past few years has bucked that trend. In no particular order there was the order from the EU that forced Microsoft to offer different browsers, Google released Chrome and the introduction of tablets introduced people to other browsers. I think up until Chrome was released Firefox was a little too heavy but nobody noticed. 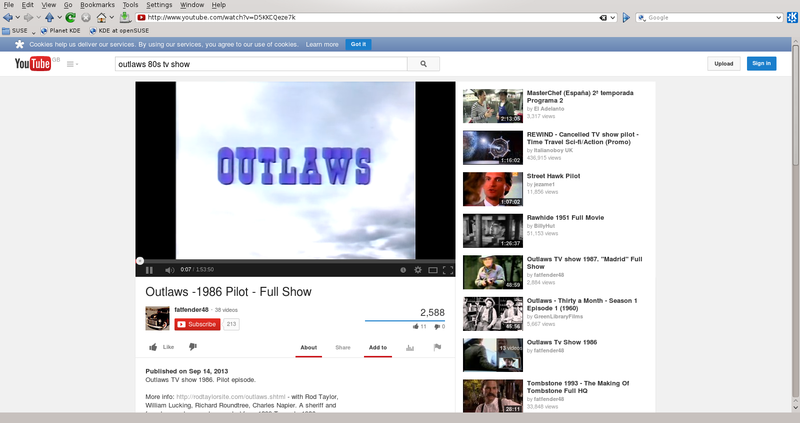 Chrome was a breath of fresh air with it’s minimalistic interface. It was uncluttered and provided brilliant performance. This forced Mozilla to up their game and over the past few years Firefox has gone through a great transformation and is definitely my preferred choice. What is the test criteria? The things I plan to test in this comparison are page rendering, features and look and feel. For page rendering I have chosen a range of sites with different levels of complexity and I will highlight any problems that arise within each browser. These are all sites I would use fairly regularly. If the browsers can render the pages correctly then they pass the test. No images really for this one as it is my online bank account. I was able to move money around and look at transactions. Visit the everydaylinuxuser sub-reddit and get all posts earlier than everyone else. Obviously both browsers let you browse websites but there is more to a browser than just web browsing. When you find a page you like you might want to bookmark the page. Within Firefox you can bookmark a page by pressiing CTRL and D. Konqueror provides the same functionality with CTRL and B. 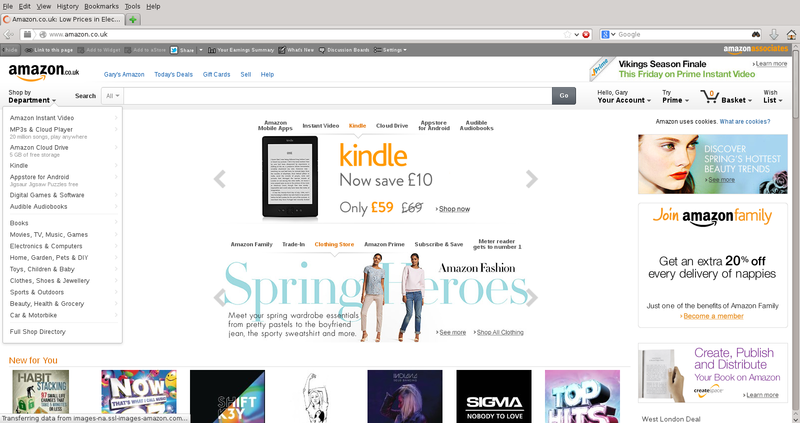 Within Firefox you can organise the bookmarks by selecting “Bookmarks – show all bookmarks” or by pressing CTRL, Shift and O. 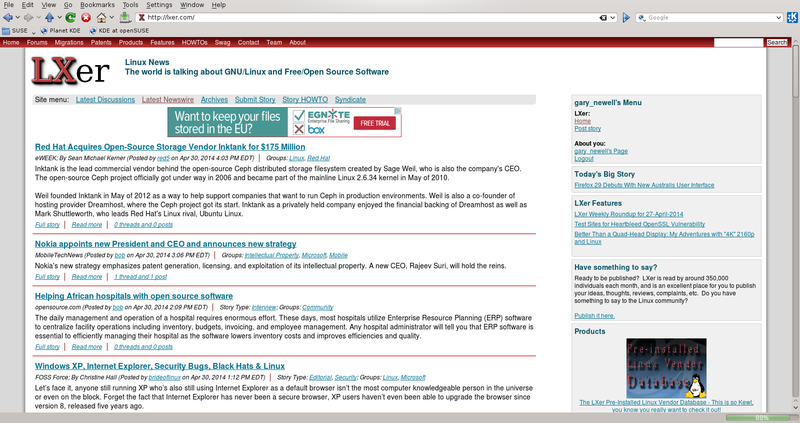 The same sort of thing can be achieved in Konqueror by selecting “Bookmarks – edit”. 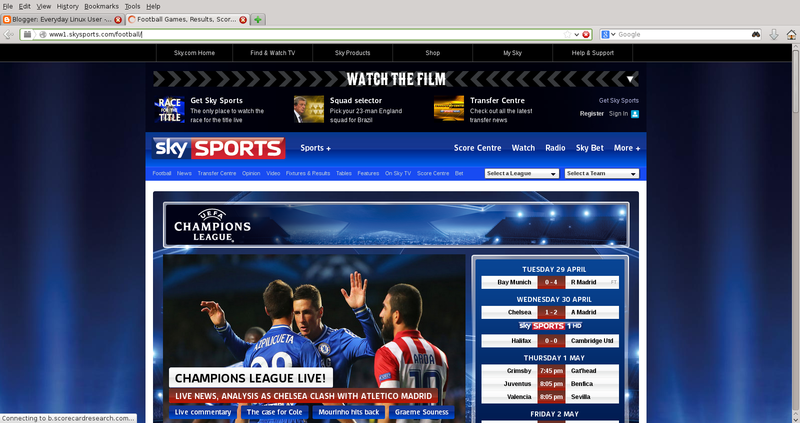 Both browsers feature tabbed browsing although Firefox does it slightly better. Firefox has private browsing available which leaves little to no trace of you having viewed any web pages. This feature doesn’t appear to exist within Konqueror. Conversely Konqueror enables you to view web pages in webkit mode, KHTML or Okular. This in theory covers all pages. For the BBC website none of the options worked correctly. Both browsers come with a range of settings so that you can set them up as you want them to work but Konqueror like most KDE applications goes one step further than most. There is pretty much nothing you can’t configure. 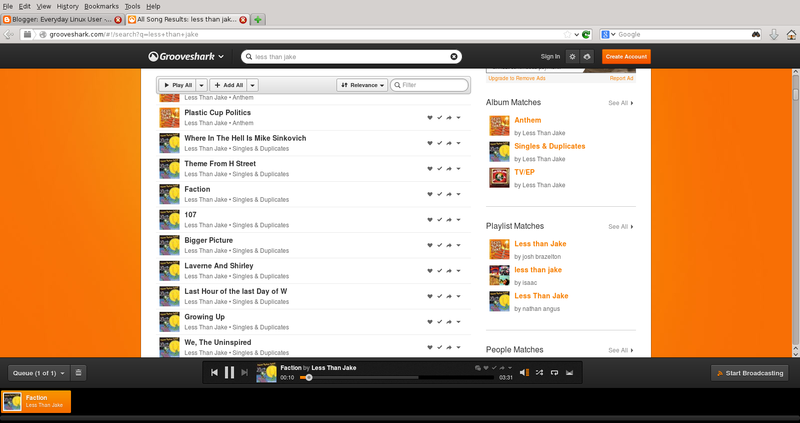 One of Firefox’s best features has always been the huge selection of add-ons. For instance some of the add-ons I like to use include Ghostery, which lets you see who is tracking your web browsing (and lets you block them), a youtube downloader, Google translator, EPubReader and PinImage. Firefox as mentioned previously is my browser of choice and so it will come as no surprise when I say that it looks great. 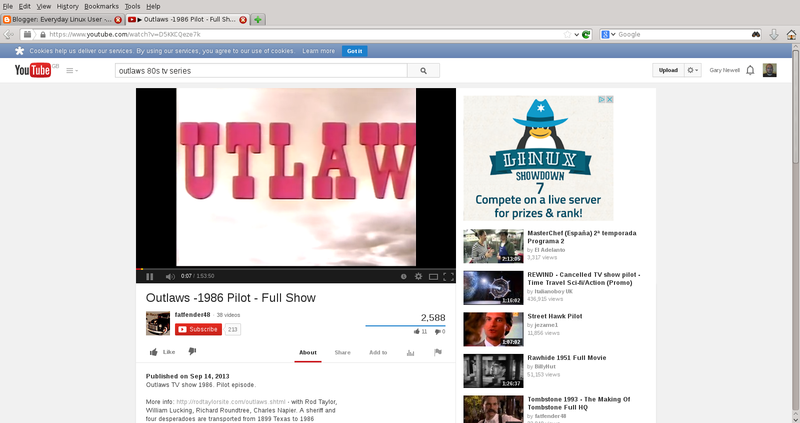 Firefox is uncluttered but has all the features you could possibly want. Konqueror actually looks good as well. To be honest there is nothing to split them. Firefox has extra features that Konqueror doesn’t have and the add-ons might be a deal breaker for some people. The page rendering worked perfectly on every site I tried and to be honest I use it everyday so if it didn’t work I wouldn’t use it. Konqueror would be fine for most circumstances but there was at least one example of a page not rendering properly. This could be the reason that openSUSE ships with multiple browsers. Have you used Konqueror? What have been your experiences? 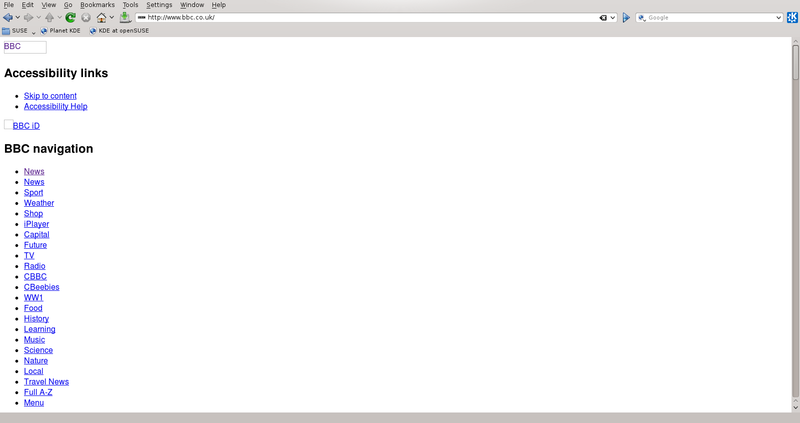 I have experienced at least two occasions when Konqueror was able to render a Web page that Firefox could not. One was a ticket booking site for a rock concert (Firefox could not display the clickable seat map and so I used Konqueror to be able to chose a seat); the other was the Pharrell Williams site 24 Hours of Happy (Firefox couldn't display it at all in Linux, but Konqueror could). 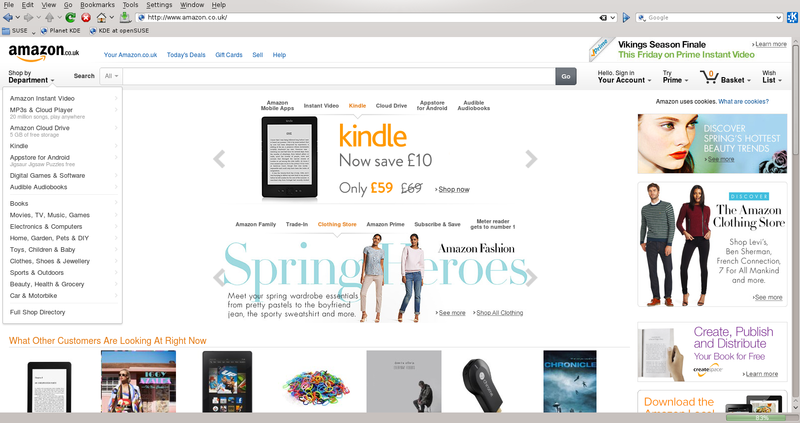 Ultimately this made me ditch Firefox in Linux as my main browser. This is an interesting point. How many of us have been to a site that hasn't rendered properly and blamed it on the site rather than the browser? 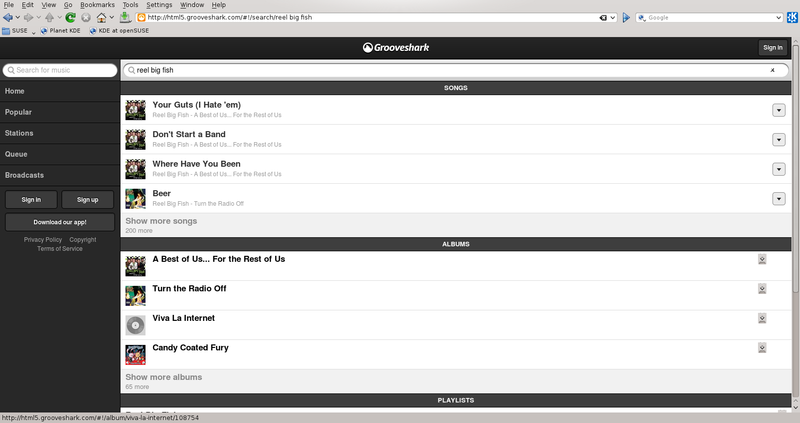 I would imagine that all browsers have issues with rendering sites at one point or another. My own experience with Konqueror was that if you don't need loads of add-ons then Konqueror works just fine. Bit of a big one about the BBC page not loading correctly, anyone else have that problem? 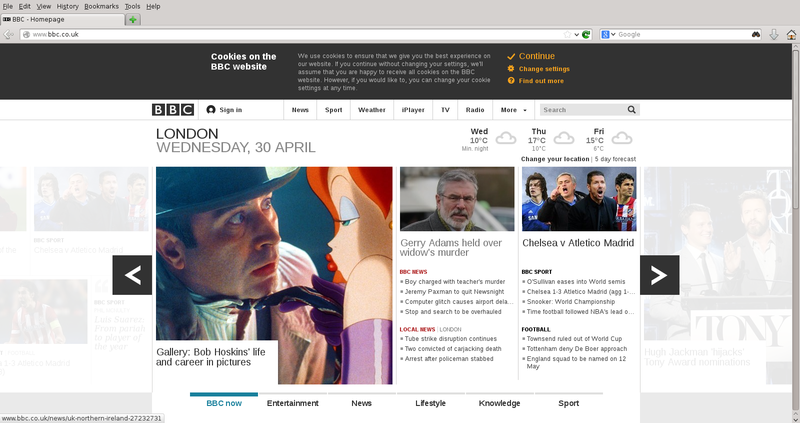 I don't use openSUSE but I can tell you that the BBC website works fine using Konqueror on PCLinuxOS. 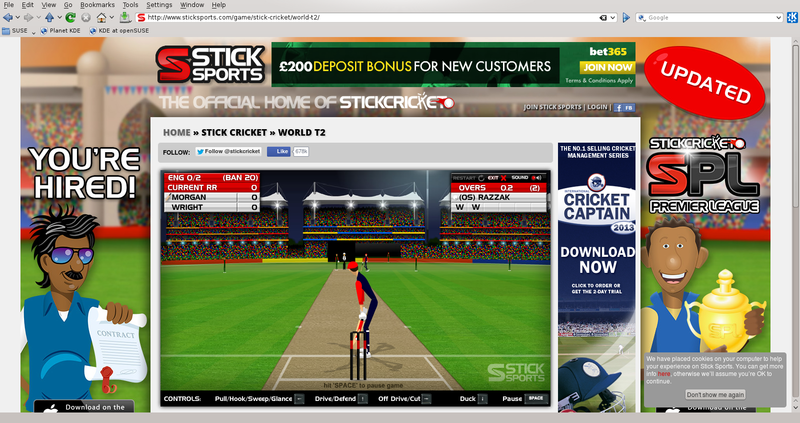 The BBC Web site renders correctly in Konqueror for me. 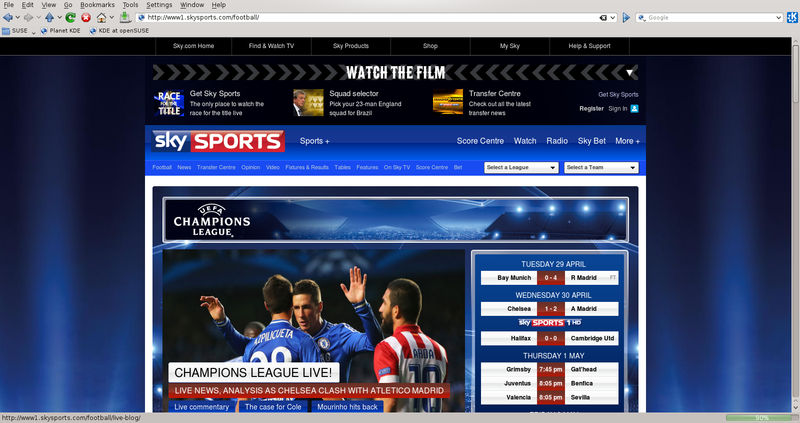 I'm using 64-bit Gentoo Linux and KDE 4.13.0, although the BBC Web site rendered correctly in previous versions too. I'm using Konqueror with the WebKit browser engine (I have not tried the BBC Web site with KHTML or KJotsPart as the browser engine). I forgot to mention that Firefox in Linux does not play videos on the Rotten Tomatoes Web site in my installation, whereas Konqueror has no trouble playing videos on the Rotten Tomatoes Web site in the same installation. 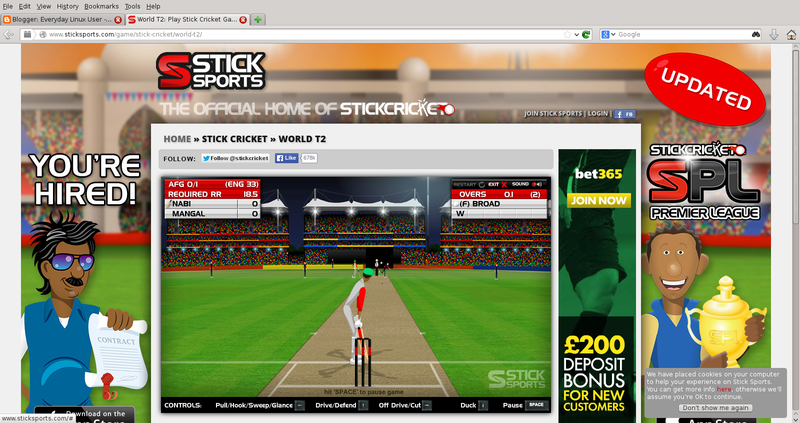 So my guess is the problem with Firefox lies with the Gecko rendering engine. So, in my case, I have come across at least three Web sites that Konqueor can handle and that Firefox in Linux cannot on the same machine running 64-bit Gentoo Linux. Using Konq in PCLinuxOS, the BBC displays poorly and also your website 'everydaylinuxuser'. I remember from the near past that there are a number of sites 'not passing'. There should somewhere be a (simple) solution for this. I wonder if Nick Elliott want to dip in here ! 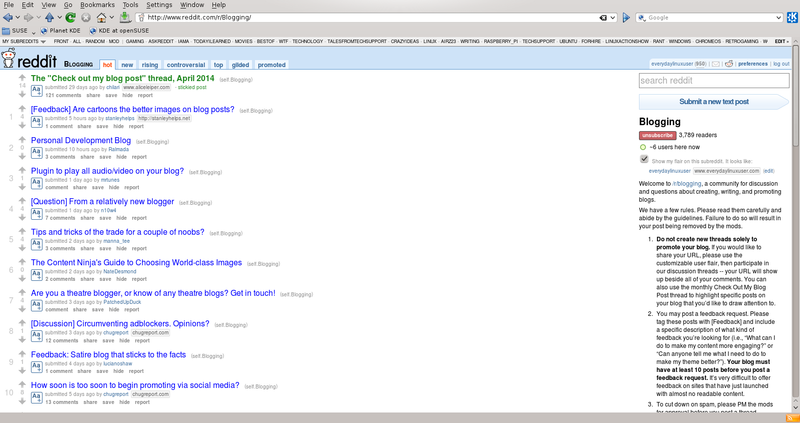 I tried my site in Konqueror within openSUSE and it appeared to be ok. You can choose whether to use webkit of KHTML. Maybe that makes a difference. It didn't with the BBC though. Your site seems OK, and I checked http://www.bbc.co.uk... apparently someone fixed something over there, as it rendered quite reasonably. I'm trying to figure how to use webkit… there is a package called webkit and it is installed, but Konqueror won't offer it as an option in its settings: there's just KHTML. Not sure why the BBC/'everydaylinuxuser' etc. works for me, I'm using vanilla PCLinuxOS with no unusual changes. All I can say is it works fine on both the 32-bit and 64-bit versions and I make sure I apply any updates when they are released. Oh, and I should add it's KDE – 64-bit is the "MiniMe" and 32-bit is the "Full Version". Hi, thanks for the review. Konqueror is a nice piece of software and has not gotten much love as of late — partly because of the browser race, with Firefox and Chrome leaving everyone in the dust and partly because folks decided to spin some functionality to Dolphin (not the mobile browser, it's the "new" KDE file manager). But before that, there was Opera, and it was usual to try sites which didn't render correctly in all three, Firefox, Opera and Konqueror. 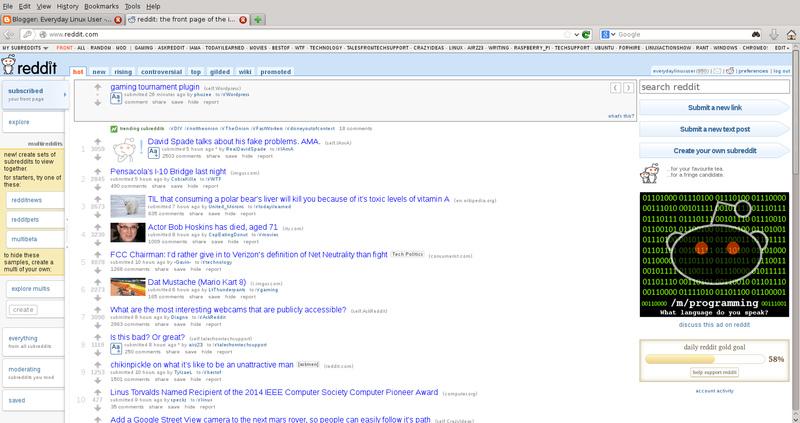 Also, Firefox was heavier and computers way slower; Konqueror shared a lot of libraries with KDE and thus was a light option inside that desktop. I am looking at the same 'things' as above in previous post. However, I am using PCLinuxOS MATE this time. You can always trust PCLinuxOS. A really solid distribution. 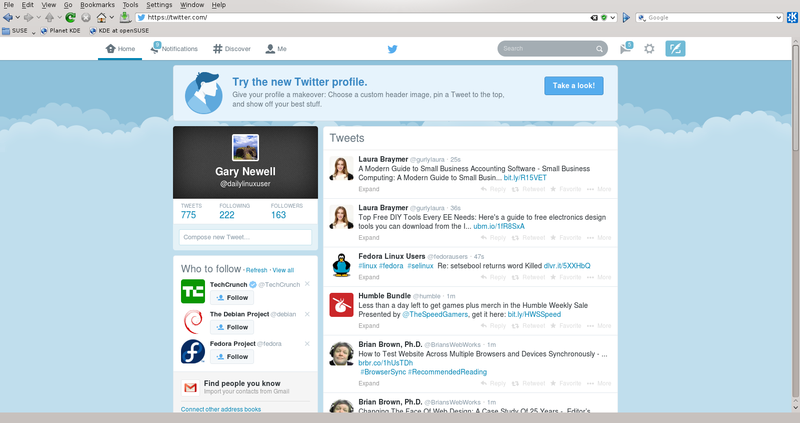 comparing firefox to internet explorer is insulting to firefox plus it to me offers more or at least better choices. Konquerer also to IE is no comparison even if they stopped improving it they are the obvious winner. Not a windows hater they do have nice games but, Linux does too just different. These are my opinions do with them what you like, using Firefox almost exclusively except for today installed chrome cause it by default has Hangouts which I think less issues it may be which allows me to do video calls without much issues especially when we go live. Still a fan of your blog just opinionated like many Linux users especially the older ones. I mentioned throughout the review that Firefox is my browser of choice. No comparison at all between internet explorer and Firefox. Firefox has always been better. used to be Chrome, FF and reKonq on Kubuntu..
it is now Chrome and reKonq 2.4.2 ,… I dont support any organization that is intolerant of the opinions and wishes or the MAJORITY of Cali. voters. If Firefox thinks that more than 50% of people arent eligible to work at Mozilla because of their views, then there is no need to continue supporting them. I have and its never a problem because our work comes first. Mozilla broke the rule that your work is the most important thing in FLOSS. Ive never dropped software for non-technical reasons before but Mozilla makes me physically ill now. Konqueror uses KHTML by default I believe and Rekonq uses the rendering engine used by Chrome. Ive used both and didnt even notice until a week after I installed my desktop that reKonq is teh default browser and after using it, I didnt care. 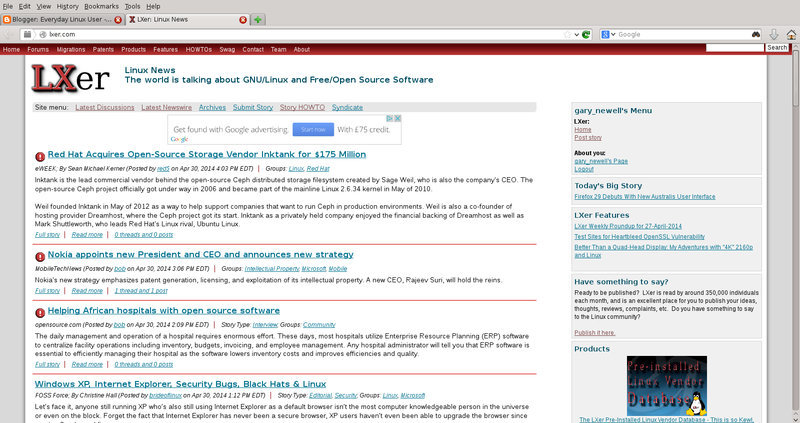 I use epiphany and works fine on all websites, ie what is require a browser that is safe , light and fast. openSuse also comes with Mozilla's SeaMonkey. I've been using Firefox since its inception and I was able to install it. 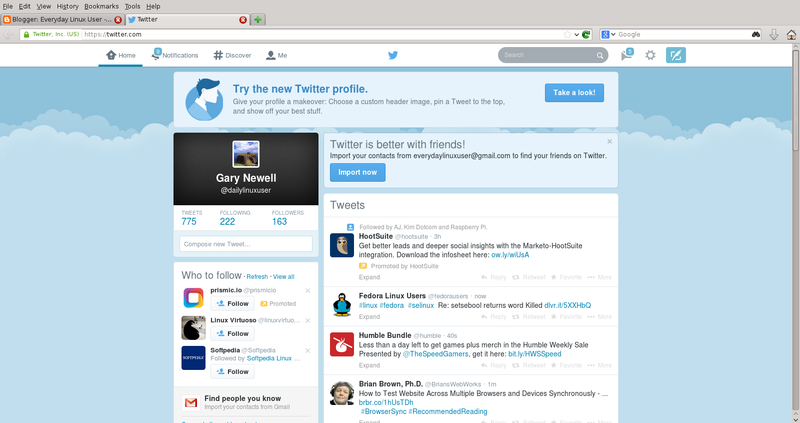 I've used Konqueror extensively as well (on Kubuntu Linux) and it's worked just flawlessly. I ceased using Internet Explorer when I ditched Windows altogether in 2003, and have been an advocate of F.L.O.S.S. ever since. I will say that Konq is a tad bit faster than Firefox, but overall they're both solid performers. Konqueror has the nicest looking text rendering and the best smooth scrolling. It also has a very slow JS engine by today's standards and is incompatible with quite a few sites. It is optimal for reading longer texts or reading text-heavy sites like Reddit.